Here are the top hotels for your Antigua beach trip! Backed by rainforest, this upscale, all-suite, beachfront resort is 16 km from the historic Nelson's Dockyard marina and 20 km from V.C. Bird International Airport. Luxe suites with cool decor come with floor-to-ceiling windows and sea views. All feature flat-screen TVs, iPod docks and free Wi-Fi, plus minibars and coffeemakers. Breakfast and afternoon tea are free. There are 8 restaurants and bars, plus outdoor pools, a spa, a gym and a yoga pavilion. Other amenities include sailing, water sports, tennis and a screening room. 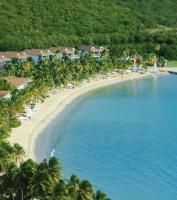 Set on Seven Mile Beach, this relaxed all-inclusive Antigua beach resort is 7 km from VC Bird International Airport. The bright rooms provide Wi-Fi access, and tea and coffeemakers; some add balconies. Minibars are available for a fee. All drinks and meals at a beachfront buffet restaurant are included, as are kayaking, snorkeling and windsurfing. There's an outdoor pool, a gift shop and regular live entertainment, along with sunloungers on the beach. Massages, diving excursions, tours and airport transfers are offered for a surcharge. Set on a hillside overlooking the sea, this posh Antigua hotel is a 12-minute walk from Jolly Harbour Beach and 11 km from Mount Obama. Featuring verandas with scenic views, the sophisticated, breezy rooms and villas also have flat-screen TVs, free Wi-Fi and iPod docks, as well as minifridges and tea and coffeemakers. Airy villas provide travertine floors, kitchens and living areas, plus picture windows, infinity pools and covered dining terraces. Breakfast is included, and there are 2 restaurants, as well as regular live entertainment. There's also a spa, an outdoor pool and a fitness center, plus a free beach shuttle.